♥ Mama 2 Multiples ♥: Purex with Crystals Fragrance Laundry Detergent Review & Giveaway! Purex with Crystals Fragrance Laundry Detergent Review & Giveaway! Laundry is probably the biggest chore in our house, but it's the one I despise the least. Part of that is thanks to Purex laundry detergents and their wide array of other laundry enhancing products! I have to be honest...we used to use Purex classic laundry detergent many years ago before we had children, when we were tight on money, since it was always so much cheaper than other brands. I was never very happy with it though. It never seemed to lather up enough and I felt like I had to use SO much that it wasn't worth even the cheaper price. I could NOT be a bigger Purex fan today, and SWEAR by ALL of their products! I absolutely refuse to buy any other brand of detergent now, no matter what kind of sale is going on at my local stores! 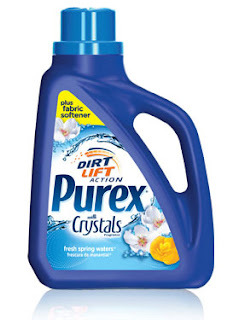 That's why I was SO excited to get to review yet another new product from them, Purex with Crystals Fragrance plus Fabric Softener Laundry Detergent! I had tried out regular Purex detergents, and the separate Crystals product, all of which were loved by me and my family, so I just knew this would be awesome! And, I was right! This detergent smells AMAZING! The fresh spring waters scent made it easier to get through the still colder days we had at the time I received this bottle to try out and review. We have some clothing items that have to be hung up to dry rather than put in the dryer, so with all of those items hanging around the house, it made our home smell SO fresh and spring-like! The scent the detergent left on our clothes days and even a week after washing them, was simply delightful! It's long lasting, soft, and oh so fresh! Another home run for Purex! Purchase it: You can purchase Purex plus Crystals Fragrance and Fabric Softener at a grocery store near you! WIN IT: THREE lucky readers of Mama 2 Multiples are going to WIN a coupon for a FREE bottle of Purex plus Crystals and Fabric Softener of their very own! To enter, simply fill out the giveaway form below and follow all instructions!